Quickdraw Offers 50 Film Passes For The GIRAF Animation Festival In Support Of Sled Island! We're thrilled to announce that Calgary's arts community continues to offer generous support in the wake of Sled Island 2013's cancellation! Today, the Quickdraw Animation Society has announced that it will be offering 50 Film Passes to its annual GIRAF animation festival to the next 50 people on our list of pass holders who chose to forgo their refunds! Each pass gives access to all feature and short film screenings at this November's festival. We will be notifying the lucky 50 pass holders shortly! The GIRAF Fest offers multiple days of indie and underground animation programming and is one of our favourite festivals of the year! The sincerest of thank yous to GIRAF, The Calgary International Film Festival, Theatre Junction GRAND, the Calgary Underground Film Festival and every Sled Island 2013 pass holder who has supported the festival before and after our cancellation earlier this year. It is absolutely touching and extremely helpful! 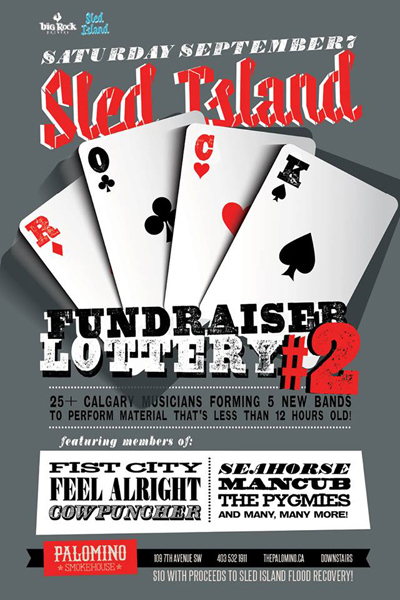 Sled Island Rock Lottery #2 - Fundraiser! What do you get when you throw 25 of Calgary's best loved musicians in a room, force them to draw names from a hat to form entirely new bands on the spot and charge them with the task of writing and performing material that's less than 12 hours old? If the last time we did it is any indication - an unforgettable and mind-melting night! It's time for the Sled Island Rock Lottery #2! On Saturday, September 7th at the Palomino, we're doing it again in the name of raising funds for the festival. Featuring members of Fist City, Cowpuncher, Seahorse, Feel Alright, The Pygmies, The Slabs, The Weir and many, many, many more, it'll be a weird and wonderful one-off night.